Rantspace is the digital home of Sticker, who is in the process of moving to Manchester from Aberdeenshire, where he's been involved in organising meetups for bloggers and flickrheads - he promises to come to our meet Aug. 12 at Urbis, too. Sticker rants about pop culture, society, security, gadgets, the technology sector, football and other stuff. Sol Flamberg writes SollyBear, a personal blog about his adventures in life. He recently got married. Congrats. A line at the top of Tomog asks: 'Do you think it's dangerous to have Busby Berkeley dreams?' I know that phrase from somewhere, but where? Tom Ogden, the writer of the blog (who recently moved to Manchester,) also says "some other things I find pretty or interesting include indie-pop, books, space, films, the web, maps, design, cities — all sorts of stuff really, but mostly it’s love and science." Another couple of photoblogs for the list. A fairly straightforward collection of Manchester snaps is at Zamyatin. 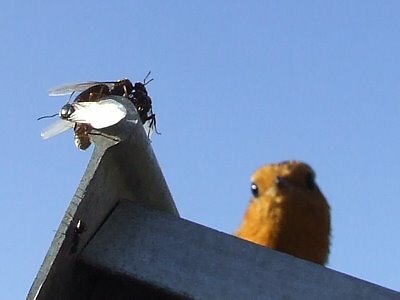 And intellectual-idiot has some great nature snaps up at the moment, including a robin vs. flying ant series that's pretty incredible... see one above. Schmultz: Yiddish for “Chicken fat” but has been appropriated by Hollywood types to refer to emotional mushiness. Not to be confused with “Schmutz” (dirt). In my experience, it's often spelled Schmaltz, as in, "I thought Superman Returns was waay too schmaltzy." I did, too, but more on that later. Of course! Thanks Nick. Hope you're enjoying life in Manchester. Thank you for linking to my site, how exciting this all is! I was looking to find bloggers around my new city and you bring them to me, how lovely. Oh, and yes it is a line from one of my favourite Magnetic Fields songs. Book Club Records looks sweet, Nick! I'm off to have a proper look. Sounds like you've managed to suss out a lot of the great places in town, Tom... good work! Hope to see you at the blogmeet Aug. 12 at Urbis.